These Salmon Cakes are so versatile! Diced salmon mixed with shallots, Dijon, Worcestershire and a hint of cayenne. Mixture is rolled into a log so that you just slice and bake. Can be cut smaller for a bite-sized sensation or the whole slice can be served for a light meal or a grilled burger. The wasabi aioli finishes off the delicacy. Make a double batch. Form one batch into a log and freeze. When you need a fast meal or company comes, simply slice and bake. Large slices can be served for brunch, lunch or a light dinner and grilled as an alternative to a burger or small slices can be used as an appetizer or hors d'ouerve. 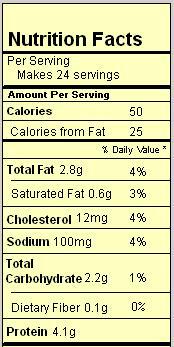 Nutritional Information for small cake with no topping. Salmon, no skin, cut into 1/4 inch cubes - 1 lb. 1. In a small bowl, mix: 1 cup mayonnaise, wasabi paste and 1/2 cup small-diced shallots. Set aside. 2. In medium-sized bowl, mix all remaining ingredients and roll into a log that is approximately 2 1/2 inches thick. Cover with plastic wrap and place in freezer for 5-10 minutes to firm. 3. Slice salmon log into cakes or roll salmon balls into desired size and flatten to form small cakes. For Stovetop: Heat 3 Tbsp of Olive Oil on medium-high heat in a skillet large enough to hold the cakes. Saute for 2 to 3 minutes on the first side and about 1 to 2 minutes on the other or until crispy brown on the outside and just cooked through. For Oven: Place cakes on cookie tray and spray with cooking spray. Place in 350 degree oven and bake for 8 minutes per side until firm, cooked through and starting to brown. For Grill: Spray grill racks with cooking spray or olive oil to prevent burgers from sticking. Start grill on medium high heat. Place salmon burgers on prepared grill and grill for 6-8 minutes per side until firm, cooked through and starting to brown. 4. Top cooked cakes with wasabi aioli and enjoy!